Private equity funds are the widely accepted investment strategy for pensions, endowments, family offices, and other investors to access the private markets. But the reported ‘returns’ of PE funds are misleading, representing only a partial view of the capital involved. Typically, private equity fund returns are shown for deployed capital, which can persuade limited partners (LPs) that a fund's returns are higher than reality — up to 50% higher, in fact. By carefully considering a fund investment from an LP’s perspective, we can first understand what reported returns do mean and then build more holistic picture to appreciate the overstatement. Sitting on the LP side of the table, what does it mean to "invest in a PE fund"? Legally, an investor will sign a Limited Partnership Agreement stating their obligation to provide capital for future investments. A large figure is committed to the fund up front and an LP naturally treats that commitment as a portfolio allocation to private equity. In return, according to Preqin's 2016 PE Report, the top quartile of funds deliver a 22% IRR (and what fund admits to being outside the top quartile?). Two inaccuracies exist with this 22% number: one an assumption and the other an omission. The assumption is, as Harvard Business Review points out, the IRR is calculated on a cash-flow basis. With that analysis, reported IRRs imply that cash distributions from selling investments are reinvested at the same IRR over the entire investment period. That's untrue unless LPs can deploy capital from PE investments immediately into equally profitable opportunities immediately as funds are distributed. The omission, a piece missing entirely from funds' calculations, is the hidden but considerable opportunity cost of committed capital. 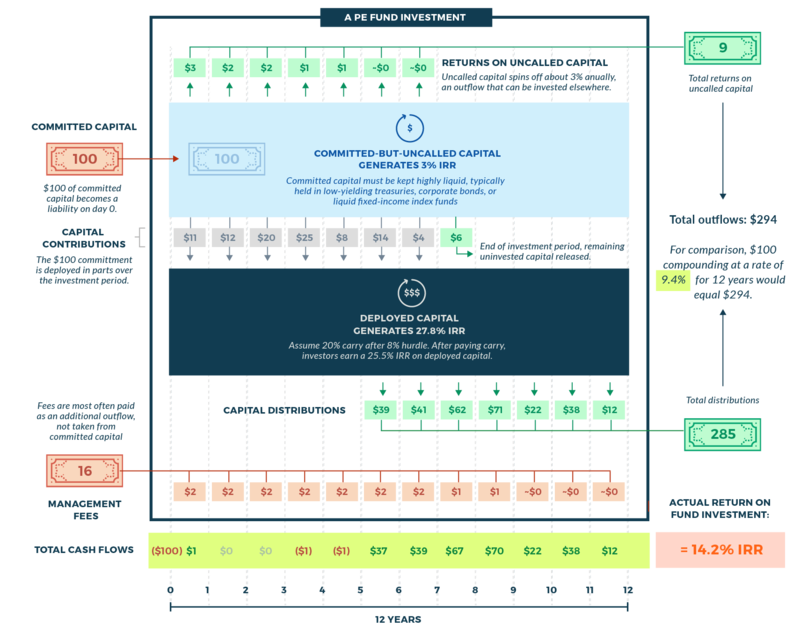 Committed capital:the amount of money a limited partner dedicates to a fund, which is deployed over several years as investments are identified. Funds structured with capital commitments are dubbed ‘blind-pools’ because investors commit into a fund without knowledge of exactly where the money will be invested. The general partner (GP) will raise a fund, essentially securing “dry powder” to fuel future investments, then go out and source the exact deals over many years with the money close at hand. When a new investment into the fund is secured, the GP sends LPs a capital call that requires delivery of their share of capital, typically within 5–10 business days. LPs invested in private equity funds must maintain highly-liquid and stable-value assets to respond to capital calls on such short notice. Such funds are typically held in low-yielding treasuries, corporate bonds, or liquid fixed-income index funds. While on standby, uncalled committed capital takes a double hit: (i) paying full management fees and (ii) losing the excess returns expected from a private equity allocation. So how should a limited partner break down the 22% number and get to reality? If the reported returns met our expectations at face value, we could think of PE investing as something quite simple: a compounding black box. Money would go in, time would pass, and then more money would come out, with net returns equal to 22% IRR on everything we put in. Let's draw out that logic over a typical fund lifespan of 12 years (Palico) and scale down our initial investment to a single Benjamin. $100 goes in at time zero, works for 12 years making 22% each year, and boom — we should get $1,087 at the end of the party. Right? If only it were so simple. Unfortunately, most investors quickly learn that their money does not go in all at once, nor it is distributed in one lump sum. We can modify our thinking to illustrate how a $100 investment is actually deployed piecewise over the investment period, which is typically 7 years (Terms of Private Equity Funds ). When the investment period expires, not all of our money was even deployed. 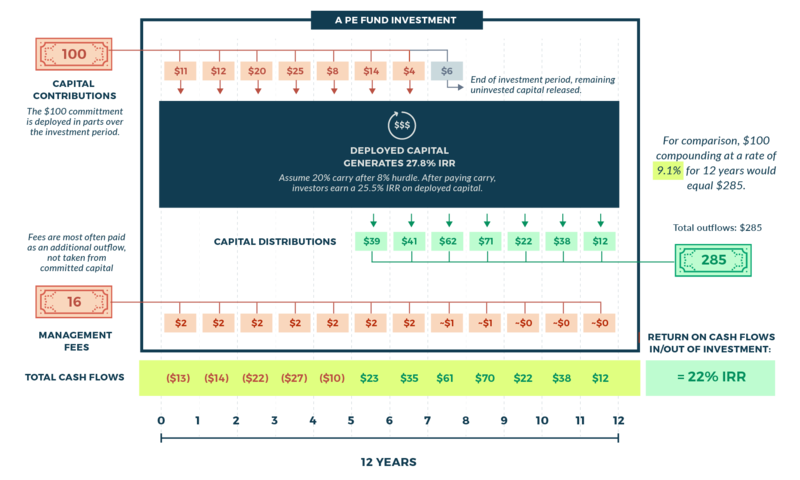 Based on data from Preqin for the average deployment schedule, funds actually invest around 94% of committed capital and the remainder is released at the end of the investment period (a little troublesome since those dollars paid fees while waiting). Which reminds us, we have to include management fees as an additional outflow. During the investment period, fees are generally highest, at 2% of committed capital and drop to around 1% of invested capital for the remaining years. The impact of full fees siphoned from large amounts of undrawn capital makes the fee drag particularly steep at the outset, amplifying the what investors call the 'J-Curve'. J-Curve: a shorthand to describe an LP's returns when investing in funds. Initially, capital calls and management fees are negative cash flows before portfolio company exits bring positive cash flow distributions in later years. Now, for the good part: distributions. We can expect distributions to start after year 5 and continue until the end of the fund. Following historical aggregated fund numbers, we can translate a distribution schedule into dollar amounts. In our assumptions, deals last five years and distributions are shown after performance fees, calculated using a standard 20% carried interest and 8% hurdle rate. If you were thinking of a PE fund as a black box, the results under this new picture are painful. While our IRR remained 22%, instead of the $1,087 output we expected, we're only getting $285. But, funds aren't lying about their IRRs, so what happened? Well, the time that our money spent deployed in the box decreased from our original thinking. Instead of all of it spending the full twelve years deployed, our dollars were deployed piece-by-piece over seven years and exited five years after they went to work. The cash inflows and outflows at their respective times equal a 22% IRR after fees, but now we are much less pleased. This reveals how most funds can report fantastic returns on deployed capital. The method is equivalent to a hedge fund storing most of its assets in cash and only measuring its performance on capital active in the market. It fails to provide a holistic picture of the manager's AUM performance. By only viewing the dollars going directly in and directly out of a fund, we can be fooled into thinking this models the return on our initial investment. The crisp Benjamin we first put onto the table gave up better opportunities for returns to sit and wait as "dry powder" for the fund manager. The cost of this committed-but-uncalled allocation must be appropriately tracked from time zero — not when it was deployed — but when it was set aside as committed capital. Committed capital creates a significant short-term liability and LPs need to hold highly-liquid stable assets to meet capital calls on short notice. Consequently, LPs typically increase holdings in liquid fixed income assets, which optimistically generate a 2-3% IRR (essentially offsetting management fees but little more). Maintaining liquidity for committed capital liquid is required to support a PE fund investment. As a result, we must include the opportunity cost in the fund return equation. To incorporate committed capital, we immediately invest our committed capital in highly-liquid stable assets. These assets distribute 3% annually, and after seven years (the investment period), our remaining committed capital is released. Once we include all of the boxes that our capital is in for a fund investment, our actual IRR returns are much, much lower. Here’s the second revelation: Our total dollars out actually increased slightly with an additional $9 earned on committed-but-uncalled capital from $285 to $294 ­ — however, because we are now including committed capital as an investment active on the table, our IRR decreases from 22% to 14.2%! Remember, IRRs are calculated based on cash flows in and out. Funds don’t consider dollars ‘in’ until they are deployed. Investors must consider their dollars ‘in’ when they are committed, as their liability to the fund is immediately moved into liquid holdings earning minimal returns. Time ticking against that idle capital lowers the IRR of a fund investment dramatically. Must include the cost of committed capital. Investors need to be mindful of this reality. Reported fund returns can overstate the truth by ignoring the effects of committed capital — a sleight of hand that can inflate the real number by 50% or more. Outside of the largest institutions in the world, few investors can mitigate the costs of committed capital. All investors in PE funds need to be aware that their returns are not as advertised. The PE asset class still performs incredibly well when compared to peers, but the fund structure is a far cry from a compounding ‘black box’.